Lappy is a little dog that was presented as a case of vomiting and lethargy just after the first of the year. Conservative therapy was not successful and we started a workup for the vominting problem. We found an elevated lipase and an mildly elevated white blood cell count with a little cranial abdominal pain . . . classic pancreatitis. We started therapy over the weekend and things looked pretty good. However, when we started water back the vomiting recurred. Radiographs revealed nothing but contrast material was used to outline any "radiolucent" material present. 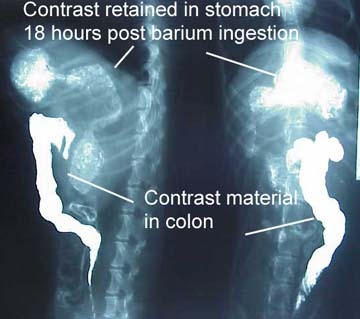 Early in the barium series a "filling defect" was seen in the stomach but more x-rays were taken (to the owner's dismay!) and an area of suspicion was confirmed by the fact that the stomach had not emptied 18 hours after the barium was given by stomach tube. Something had to be keeping the barium there. 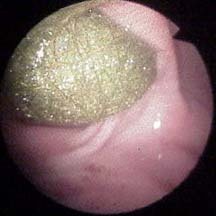 After anesthesia endoscopy was performed. The stomach was explored and no foreign body was seen. 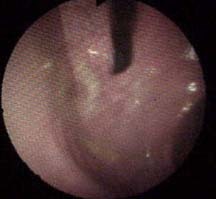 In this veiw the endoscope is seen entering the stomach at the cardia of the stomach. Difficulty was encountered going around the stomach of this small dog and we felt that the pyloris had not been adequately visualized. We DID however ALMOST quit at this point. We elected to pull the endoscope out and start over. By repositoning the scope we felt that we might be able to push around the corner of the fundus of the stomach and visualize the pyloris of the stomach better. You might imagine our excitement at being able to now see what we had expected . . . a fabric type foreign body. However, you might (if you know me) be able to imagine the cussing that ensued when I was unable to grasp the foreign body with our wimpy devices to do so. I can only tell you there was some. We felt that we needed to quit messing around and get this sucker out of here. We performed a gastrotomy and removed the foreign body with little contamination. Lappy was eating 1 hour after the surgery. Removing foreign bodies from the stomach is not an every day occcurance around here but not something that we don't feel comforatable doing. If you compare this foreign body to the x-ray the relationship should be obvious. 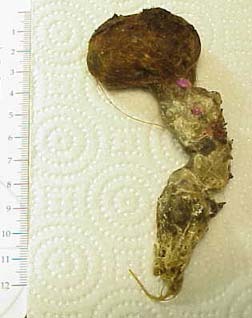 The mass was composed of hair, plastic and string and was very dense. In questioning the owners a fter the surgery we found that Lappy was fond of a plastic brush that the young girl in the family had in her room and there was part of it missing. Lappy weighs less than 9 pounds. As you can see the foreign body is at least 12 cm long and about 5 cm across. No way would this ever pass through. This is not the first time that we have seen this type of foreign body. I will note that in each case the hair has been red hair though I would not want to assert any significance to this.! There. Can you see the relationship between these two structures!!?? I guess it took a while but that's the way it goes sometimes. In retrospect the diagnosis seems obvious but this case also serves to represent the theory that you just have to stick with the case and it will usually reveal itself if you follow the principles. As of the weekend of 1-14-2001 things were still looking good with Lappy!! In a sad footnote to Lappy's case Lappy was hit by a car and killed a few weeks after this last report. It is a sad fact that this type of trauma remains one of the most frustrating points of our practice here. We all try to do our best to minimize the likelyhood of exposure to trauma like this. We were all heart broken when Lappy was lost.